Why not host your Meetings at the Pan Pacific Singapore Hotel featuring a pillarless ballroom for a cocktail reception of 800 people, the hotel's function and meeting rooms may be set up for theatre and classroom Meetings, and cocktail, banquet or buffet-style events. Pan Pacific Singapore's new meeting facilities, the Ocean Rooms, together with the Pacific Ballroom, have the world's largest in-house installation of ADSL lines for a hotel, offering high-speed and wireless Internet access during your Meetings. A comprehensive range of audio-visual equipment, for use during your meeting, is also available. The hotel provides a unique Meeting One service with a dedicated butler present throughout the event to ensure that all requests are met. 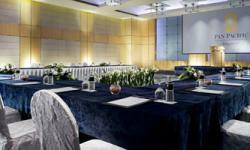 You won't be disappointed having your Meetings at the Pan Pacific Singapore Hotel.